An essayistic documentary about Jürg Ernst’s artwork «Gnomengarten». 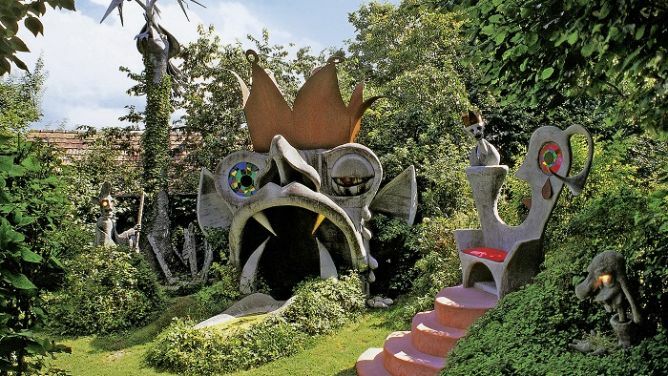 The quirky sculpture garden «Gnomengarten Schwarzenburg» in Switzerland has become widely known as a «Concreted Cabaret» with witty guided tours by its creator, the artist Jürg U. Ernst. After 15 years Ernst decided last year to close this chapter of his life and the gate of his special garden for good. With an extravagant happening in summer 2016 a portion of his figures and also the biggest sculpture, the king of the garden «Pluto» will be destroyed by a digger. Reason enough to dedicate a documentary to the unique origins and dismantling of a life’s work. Being the daughter of the artist I have intimately observed the evolution of the Gnomengarten for years and my father’s relationship to it. The dramatic destruction of the work which he has been creating for years with enormous perseverance is heartbreaking, but also incredibly provocative. With this documentary I look forward to exploring my father’s artistic journey which is intertwined with the Gnomengarten’s relationship to the community of residents who live near the garden and countless others who have come to visit it. This film will explore broader themes of artistic life and birth, and the process of change and decay, all of which is reflected in my father’s realisation of the garden, the affect of his recently declining health on his ability to maintain it and the relationship of his journey to garden and its visitors. Filming of the Gnomengarten has occurred throughout its remarkable life. Originally these recordings were intended to be a private record, but with the pending closure and destruction of the garden, this rare, intimate footage is now available and can help tell an important part of the garden’s story and my father’s journey in creating and destroying it. An incredible amount of archive footage has accumulated over the years and this material documents the beginning of the sculpture garden and the different phases of Jürg Ernst’s artistic creativity, from the expansion and growth of the sculpture garden through to his decision to complete and destroy the project. The financial contributions through WEMAKEIT will help us edit the considerable quantity of archive footage and film the Gnomengarten’s last days. These funds will also help convey the mood and atmosphere of this special garden and make the film look and sound as good as possible as we enlist support from a trusted sound designer, composer and colourist. With your financial help we will make a filmic portrait of an artistic personality who has an inexhaustible source of ideas, quirky humour and great creative power. Many heartfelt thanks for your support! In the middle of the village Schwarzenburg Jürg Ernst, the ferroconcrete sculptor and former photographer, has leased 2000 a site adjacent to the home where he lives with his family. 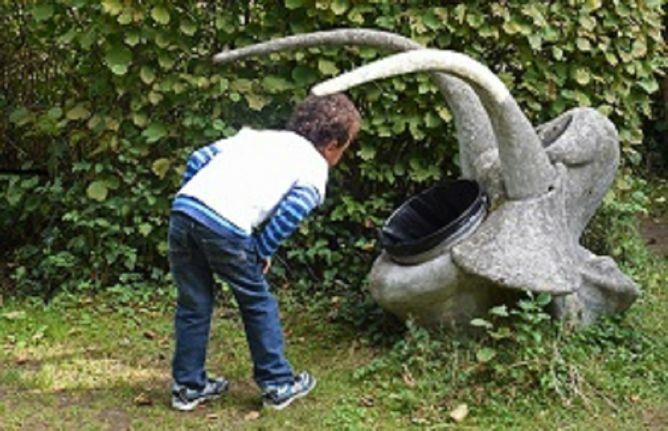 With iron and cement he started to create the quirky sculpture garden. Over the years the Gnomengarten became an insider hotspot and later a public attraction for visitors from all over Switzerland. 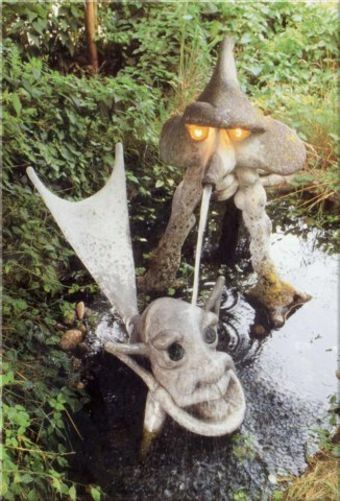 Today we find a dozen splashing and blinking sculptures up to seven meters high in the little garden area which has been built in the autumn and winter and cared for during the spring and summertime, when Jürg Ernst exchanges welding torch and concrete filler for grass and pruning shears. One only has to see a few of the figures to understand the fantastical imaginings the garden and its inhabitants may have sparked in visitors over the years, stories which have no doubt developed alongside Jürg Ernst’s personally guided tours which have included wondrous tales and histories of each of the characters, including Madame Froidevaux with her top-heavy bird, the uncompleted Helvetia, the wellness-addicted Olaf, the Marsh-witch or guard Walter Harnisch, with his weak bladder, who keeps an eye on the monumental (and ascendable) king of the garden Pluto. The Gnomengarten opened to the public for the last time during the summer of 2015. The dismantling of the garden will begin in July 2016. This project ended successfully on 7/7/2016 15:00! Many thanks! For your support you will receive a signed A5-photo collage with behind-the-scenes footage from the film shootings, including the spectacular destruction of the king of the garden Pluto. Little contributions like this make a difference! You will receive 4 artistic postcards with sculptures from the Gnomengarten and a big thank you from us! Many thanks! We will send you the signed book: «Gedanken, die beim Betonieren entstehen», a creative collaboration between the artist Jürg Ernst and the prestigious Swiss cartoonist Pfuschi (only in German). Great! You get a signed DVD (or Download) of the documentary film and 3 artistic postcards with sculptures from the Gnomengarten. Thank you very much! Wow – for your generous contribution you will be invited to the exclusive sneak preview in Berne/Switzerland late autumn 2016. As a guest of honour you will be part of the aperitif party. Thanks a lot! Countless thanks! For your great support you will receive the precious art edition «Narrenbühl» (only in German), a photobook from the artist Jürg Ernst, which includes a DVD of the documentary about the Gnomengarten and a CD with 5 songs made by the well known Bern songwriter Dänu Brüggemann, which he especially composed for the Gnomengarten. This special art edition is personally signed by the three artists. And of course you will be invited as well for the exclusive sneak preview and for the aperitif party in Berne/Switzerland late autumn 2016. A huge thank you! You will receive a special memory from the Gnomengarten, by becoming the proud owner of an exclusive piece of the biggest sulpture a piece of «Pluto»’s authentic gold-plated tooth – carefully framed as a souvenir picture. But that’s not all. You also get the special art edition, including the photobook, DVD and CD. And you will be invited for the exclusive sneak preview and aperitif party in Berne/Switzerland late autumn 2016! Thanks to you, we will be so much closer to our common goal. For your generosity you will receive a special thank you. You will be invited to be present for the spectacular destruction of the king of the garden «Pluto». This happening will take place at the end of June 2016 and will be exclusively available by invitation only. Afterwards we will have an aperitif party together. And you also get the special art edition, including the photobook, DVD and CD. You will be invited for the exclusive sneak preview and for the aperitif party in Berne/Switzerland late autumn 2016. Many thanks!! 1000 thanks! For this generous contribution Jürg Ernst comes up with something special. You can choose one of the unique wall art work from the group of ancestries (50x70cm). (original price CHF 3000.-). Transport costs not included. And you will be invited for the exclusive sneak preview and for the aperitif party in Berne/Switzerland late autumn 2016! For this great financial support the filmmaker Miriam Ernst herselves will join you at your event (wedding, birthday party, corporate event, etc.) and will record your special moment on film (does not include travel or postproduction). And you will be invited for the exclusive sneak preview and for the aperitif party in Berne/Switzerland late autumn 2016. Thanks a million!! For this remarkable financial support for our film Jürg Ernst shows his appreciation: You receive one of the sculptures of his gnome family (original price CHF 6000.-). You can make your choice of original work during a personal, private, guided tour (transport costs not included) and afterwards you will have dinner with the artist Jürg Ernst and the filmmaker. And of course you will be also invited for the exclusive sneak preview and for the aperitif party in Berne/Switzerland late autumn 2016. A huge thank you! Based in Berne (CH) and Amsterdam (NL). Bachelor degree in Science of Theater and Film at the Universities of Berne and Zurich. Attending various film courses at Klasse Autodidaktischer FilmerInnen (KAF) and at the College of Visual Arts Berne. MA Directing Documentary, National Film and Television School Beaconsfield, England. Since 2016 working as a freelance director and cinematographer.